When The Quarterly Conversation asked translator Kareem James Abu-Zeid which Arabic-writing author he’d suggest for their “Translate This!” feature, he named prolific and award-winning Lebanese novelist Rabee Jaber. Abu-Zeid certainly isn’t alone in this assessment; in a recent interview, translator-scholar Roger Allen also named Jaber as one of the authors most deserving translation into English. Jaber went on to win the 2011 International Prize for Arabic Fiction (IPAF), announced this March, further raising his global profile. By that time, New Directions had signed a deal to translate and publish two of Jaber’s novels, not including the IPAF-winning Druze of Belgrade. Abu-Zeid is now finally at work translating Jaber’s work. He answered a few questions from a translator’s retreat in Banff, where he is at work on Jaber’s The Mehlis Report. ArabLit: It was 2009, I think, when you told Quarterly Conversation that the Arab author who was most in need of translation (and had not been translated into English) was Rabee Jaber. Now, in 2012, you’re finally translating him. How did you get from there to here? 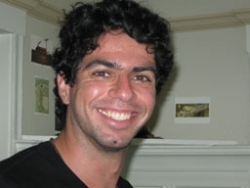 Kareem James Abu-Zeid: Like many of my translations projects, luck and good timing played a big role. I had been thinking about translating Jaber ever since I first came across his novels a few years ago – and his novel The Mehlis Report struck a particularly strong chord with me. In an ideal world, I would have been very active in seeking a press for the translation and getting the project started. But between my academic work (which takes up the lion’s share of my time) and the translation projects I already had going, I simply didn’t have the time. Then last autumn, shortly after I had finished translating Tarek Eltayeb’s The Palm House for AUC, an acquaintance who works at New Directions Press contacted me saying they had read my short blog post on Jaber and were interested in publishing his work. They asked me for a reader’s report, which I of course provided, and now here I am working on the novel, which will come out in the spring of 2013. I’m thrilled to be working with New Directions on this project, as they prefer projects that push the boundaries of fiction a little bit, and this novel certainly does that. AL: Are there other novels of his that you would like to translate? Why did you choose this one? What attracts you to it, as a reader and as a translator? KJAZ: I’ve already signed a contract with New Directions for Berytus: An Underground City, which was the novel of his I was most excited about after The Mehlis Report (though I will admit that there are still several novels by Jaber that I have not yet read – he writes them almost quicker than I can read them!). These two novels appealed to me because of the dexterous way they blend modern Lebanese political realities with more fantastical elements. The two novels have quite a bit in common, actually. They were both written in 2005, and they both involve parallel worlds of sorts: In the case of Mehlis, there is the Beirut of the dead superimposed on the Beirut of the living ; and in the case of Berytus, there is the underground city that no one above ground knows about. I will say that although I think his more purely historical fiction (e.g., America and The Druze of Belgrade) is remarkable, his symbolically dense fantastical fiction appeals to me more as a translator. I’m not thinking of any other fiction projects beyond these two at the moment: As I mentioned, I’m a full-time academic and will be finishing up my PhD on modern Arabic poetry in the next couple years, so I have a very limited amount of time for translation. AL: Jaber writes incredibly quickly: novel after novel after novel. How do you see that manifest in his books? Are they in some ways marked by this rapidity, do you think? KJAZ: I can’t speak to all of his novels, but with regard to Mehlis, this rapidity is most evident in the frequent (intentional) slippage into stream of consciousness, which is accompanied by an almost unnoticed shift from third-person narration into the first-person viewpoint of the protagonist (and other characters). The narrator of this novel is a fluid entity, and frequently dissolves into the minds of the characters before coming out of them again. The effect is that the reader often feels she or he is inside the (sometimes chaotic, and not always logical) thought processes of the characters. There’s very little concrete “action” in Mehlis, yet Jaber’s mastery of these narrative techniques actually lends a remarkable rapidity to the text. AL: Is there anything you find that’s unexpected about translating his work, now that you’re in the middle of it? Something you hadn’t noticed about Mehlis, or something unexpected about how it’s coming through in the English? Any features of the book that you notice now, as you translate, that you didn’t notice as a reader? What has been most enjoyable (and most difficult) in this process so far? KJAZ: I don’t remember laughing very much the first time I read the novel, but now that I’m translating it, I often find myself laughing out loud – one of my fellow translators here at the Banff residency who has occasionally shared a library desk with me here at Banff can attest to this! The humor is very dark, but it’s there. I think this must be one of the reasons I was so attracted to the novel in the first place – I’ve always been a fan of black humor in cinema (Robert Altman’s Mash, the Coen Brothers’ Fargo, Kubrick’s Dr. Strangelove, etc. ), so it makes sense that I would gravitate toward it in fiction as well. I think this aspect of the novel is coming through very well in the English translation. I recently read some excerpts from it in San Francisco, and the audience was definitely laughing through parts of the text, so that was of course very encouraging. Those parts of the text have probably been the most enjoyable for me. As for the most difficult, that’s probably been handling the very detailed topographical descriptions, including the names of streets, clubs, restaurants, etc., across Beirut. I haven’t visited Beirut since 2004, so I’ve been spending quite a bit of time looking at maps and photos of the city to make sure I don’t misrepresent the city in any way. Next Should Authors Pay for (and Market) Their Own Translations?